Why do some cockroaches fly? There are a few thousand species of cockroaches that can fly, but they usually do not fly because they are bad fliers. The popular rumor that all cockroaches can fly, but usually do not is accurate only to a certain extent. Not all species of cockroaches can fly, but a large percentage of their species do have wings, but not all of them fly. Why? Because they are better runners, than fliers. About 3,500 species of the 4,600 species of cockroaches that exist have wings and the ability to fly, but this ability differs depending on the species and sometimes sexual category. For example, in some species males have wings while the females do not. Some species can fly properly but cannot support its body for long periods of time and only choose flying for short periods of time. Some species are even worse at flying and can only glide from high places. Cockroaches have two pairs of wings, but they only use one pair to fly. 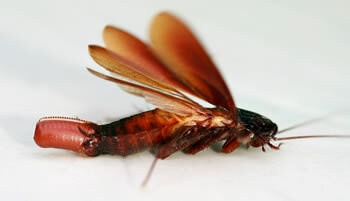 The front wings are thick and protective and is the same color as the body of the roach. When not in use, the front wings fold and lie on top of the back of the roach. The back pair of wings are hidden and protected beneath the front wings until required for flight. The insects keep the front wings lifted while flying and move through the air by using the back pair. In contrast to the front pair, the back wings of cockroaches that fly are membranous, thin and clear. Even though cockroaches have the ability to fly, they are more adept at running and scurrying. They are faster on their legs and they prefer dark, moist places to nest. The roaches have three legs that extend from each side of the thorax. Each leg is covered in pointed spines and each leg varies in length and fulfills different yet interrelated functions that enable the physical act of running. This allows the roaches to cover a distance of approximately 50 body lengths in a single second. This is why cockroaches prefer to run rather than flying.